A great golf bag does many important things for a golfer but, in the end, it must do one thing well, and that is to make our time at the golf course easier. Whether we walk or ride, the best golf bags will always be at the ready with a replacement ball, a wet towel to clean our clubs or a brush to make sure those grooves are free from dirt. The best golf bags create a safe and protective haven for our valuable clubs and personal items. With lined pockets for our wallets and electronic devices and plenty of room for storage to keep a jacket or umbrella handy, a great golf bag is like a Swiss army knife that delivers countless ways of helping us while we play. Here are 16 reviews of our favorite golf bags on the market that will undoubtedly help make your life simpler when you hit the links and allow you to concentrate on shaving strokes from your handicap! 4.1 What are the key features a great golf bag should have? 4.2 What’s a golf bag ideal size & weight? 4.3 What are the different types of golf bag and which one should I go for? 4.4 Should I go for a stand or a cart bag? 4.5 What are the known brands that make golf bags? 4.6 Small vs. Big golf bags: what’s better? 4.7 Do certain golf courses have specific restrictions on what type of golf bags I can bring? 4.8 How do I clean my golf bag? 4.9 Are golf bags waterproof? 4.10 Is it feasible to repair a golf bag on my own or should I buy a new one? The Founders Club Cart bag is one genuinely unique bag with a 14-way top that has anti-rattle technology that locks in your irons so they won’t move when you do. If you hate when you hear that clanging when your irons are bumping into one another while you walk or drive the cart, then this is the bag for you. All the amenities you would expect in a quality cart bag are found here in this model from Founders Club. A lined valuables pocket, an insulated cooler pocket, and two side handles top the list of features that will satisfy golfers of all skill levels. We can’t state enough how much we enjoyed the anti-rattle measures in this bag. Instead of that constant metal clanging sound, our round was quiet and peaceful. This feature will especially come in handy if you’ve just bought a new set of irons and did not want them banged up immediately. When reviewing the rest of the bag, we were overall pleased with its performance. The valuables pocket kept our wallet and cellphone safe and scratch-free. And we were equally impressed with the cooler pocket as it kept our sodas cold throughout the round. If you need to lift the bag into the cart or your trunk, the company has added multiple handles to the side and top of the cart bag so you’ll never feel burdened or overwhelmed by the weight. This bag is not a luxury cart bag, but then it is not pretending to be either. 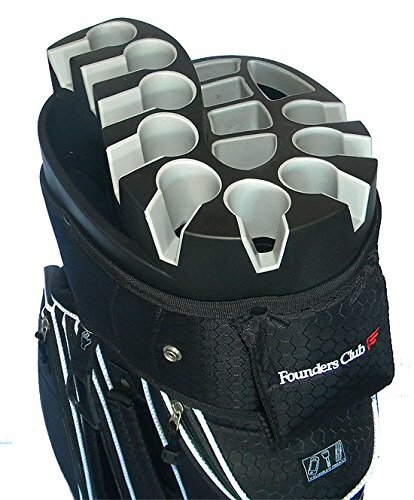 The Founders Club cart bag is an excellent option that provides plenty of room for your umbrella, extra clothing and any accessories you may need to carry during your time on the links. Dynamic rainhood included with the bag for protecting clubs in lousy weather. 14-club holder is lined and keeps the clubs protected throughout a trip to the course. Two velour-lined pockets keep your wallet safe and your cellphone from getting scratched. Pricier bag but the bells and whistles are worth it for a premium golf bag. Second on our list for the best stand bag is the Sun Mountain 4.5 LS, a mid-sized bag that delivers lightweight carrying for the course. The company has designed the LS to have a larger opening so that golfers can comfortably store woods and irons without the clutter of smaller bags. Moving the bag is a cinch with the comfort grip handle that enables easy lifting and placing when the time comes for you to put the 4.5 LS in the trunk. Although the 4.5 LS works well in the trunk, it shines when you use it for your walk on the links. A patented E-Z strap system is specially made to make the bag effortless when sliding on and off the shoulders. When we first got the 4.5 LS out onto the course, we were blown away by ten-inch opening and how simple it was to pick a club from the bag. With nine pockets on the 4.5 LS, we were pleasantly surprised at the depth of the bag’s storage. We had no problem packing our rain gear inside the bag and never felt like we added considerable weight in the process. The legs system in the 4.5 LS has a locking feature that makes the stand bag rigid, so it is perfect for hybrid use when either walking or riding, the bag won’t have an issue going back and forth. With a tough exterior shell and a host of fantastic features, the lightweight and well-designed 4.5 LS from Sun Mountain is one of the best stand bags we’ve ever taken to the course. A water-resistant pocket keeps your valuables dry and scratch-free. FlexTech stand system offers a patented easy release, so your clubs don’t stick or crowd together. Full-length dividers keep clubs off of each other in the bag. A little pricey for a stand bag, but the features and durability make it stand apart. Like its brother, the 5.0 stand bag, TaylorMade has made another exceptional stand bag for mid to low handicappers with the Flextech Lite stand bag. Featuring a dual density strap system that keeps the bag level on your shoulders, the Flextech Lite does a beautiful job of making your life easier when you are walking the course. Full-length dividers keep the clubs separated for maximum protection, and the Flextech stand system is patented by the company, making the bag one of the best on the market for minimizing the sticking of clubs when you are accessing them from the opening of your bag. Like the 5.0 but better, the Flextech bag is an advanced stand bag that delivers a sharp looking, well-designed option for walking golfers. We could talk for hours about how even the strap system keeps the bag along your shoulders. If you have an amateur golf champ in your house, the Flextech Lite is a wonderful option for their competition. All the necessities typically offered in a high-quality stand bag you’ll find in the Flextech as there is a velour-lined waterproof pouch for your valuables, a molded hip pad that keeps the bag comfortable against your body when walking and finally, a full-length garment pocket for rain gear. We were blown away by how the Flextech was constructed and even more delighted when we gave the stand bag a test drive on the course. 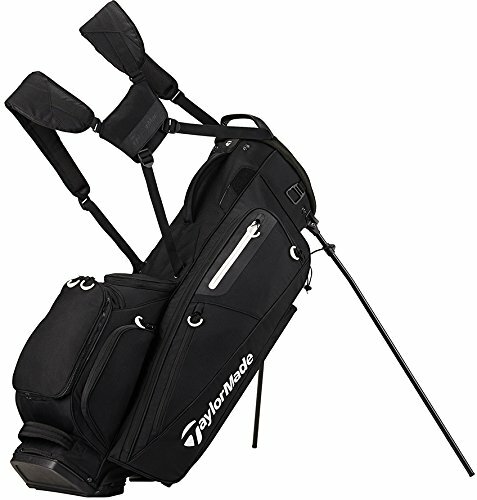 With plenty of storage in a compact package, the TaylorMade Flextech stand bag has earned a reputation for being among the best on the market. Amazing Power Pocket has a power pack that allows for on-course charging of your electronic devices. Eleven club dividers give you plenty of room to keep your clubs free of bumping into each other. Insulated cooler pocket keeps drinks cold and at the ready for hydration. May be more bag than most amateurs need, but this golf bag will last for many years with terrific function. The Izzo Versa is one of the best stand bags we’ve ever had the privilege of testing. This bag does it all and is worth all of the accolades. Featuring an 11-way divider top, the Versa provides luxury in a stand bag with a water-resistant velour-lined valuables pocket, a towel loop with built-in bottle opener and a deep insulated cooler pocket. But perhaps the best feature of this bag is the Power Pocket. If you must stay tied to the world during your round, then the Power Pocket takes care of all your power needs. Inside the pocket is a long-lasting battery that can power your GPS devices, tablets, and cellphones. What we loved about the Versa from Izzo is how well constructed the stand bag is and how you can see that during the round. The exterior is constructed from tough, durable nylon and the divider is soft and easy on your clubs. Even though the Versa comes with just a single strap, we found that we weren’t uncomfortable when walking. Perhaps the stand bag is better used as a hybrid between walking and using the cart, but don’t let that dissuade you from giving this bag an honest shot at accompanying you for your next round. Two magnetic pockets gave us the feeling that our valuables would be safe and the storage was outstanding for a stand bag. 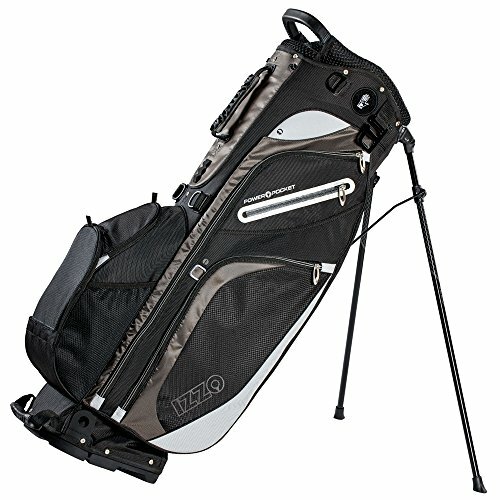 The Versa far exceeded our expectations by providing an excellent bag that completely met our needs while on the course. High-quality rain hood keeps your clubs protected and dry in inclement weather. Ten pockets hold your clothing, valuables, accessories and provide a cooler for your drinks. A smart strap system keeps the bag from twisting in the cart and locks down your clubs. The expensive bag may turn off simpler golfers, but this does pack a punch with great storage and durability. Sun Mountain has a long history of creating beautiful cart and stand bags that deliver premium features and unmatched durability. We are happy to report that their latest cart bag, the C-130, is an absolute race car of a golf bag. Highlighted by a 14-way full-length divider, few bags protect clubs better than the C-130. Three integrated top handles coupled with a sophisticated smart strap system, keeps the bag locked onto the cart without twisting, so your clubs are always at the ready. If you are into luxury features, then know that the C-130 has three velour-lined pockets with one being completely waterproof. This Sun Mountain bag also has two full-length clothing pocket for your rain gear and any other clothing you may need during your round. When analyzing this bag, we can’t brag on the C-130 enough. Not only is this bag built like a tank, but it also has all the amenities that you would expect from a top-tier cart bag. We loved the cushy full-length dividers that kept our clubs off of each other during our drives between shots. What truly stands out in this bag is the storage. Although more pockets means a heavier golf bag, we certainly didn’t mind because all of the pockets have a function that works toward a central design that is smart and innovative. If you are looking for the best cart bag that money can buy, you would be wise to put the Sun Mountain C-130 somewhere at the top of your list. Full-length dividers keep clubs separated and protected. Strong structural foundation makes this cart bag durable. Two micro-suede lined pocket keeps your valuables free from scratches and outside elements. A functional cart bag that is tough to use if you like walking the course. Weighing just five pounds, the TaylorMade Lite cart bag is easily one of the lightest cart bags available. This low weight bag is why the Lite is a terrific first cart bag for beginning golfers and high handicappers. With ten spacious pockets, the TaylorMade Lite can carry anything you’ll need on the course from clothing, drinks, balls, and tees. And don’t worry about the clubs damaging each other because the Lite bag has a 14-way divider top with full-length extensions for protecting every inch of your irons and woods. The Lite cart bag features top line construction, making it crush proof for maximum protection. We loved how easy it was to keep the bag locked onto the cart with cart strap tunnels that are reinforced to prevent rubbing and tearing. A single strap anchors the Lite and does an admirable job at keeping the shoulder from hurting and the weight level on the bag. If we have a gripe about the TaylorMade Lite, it is that it only functions as a stationary bag. When we tried to walk a few holes with the Lite bag, we noticed that it didn’t respond like other cart bags with more flexibility. We admit that it is a minor complaint, but if you are looking for more adaptability from your golf bag, you will do best to look elsewhere. 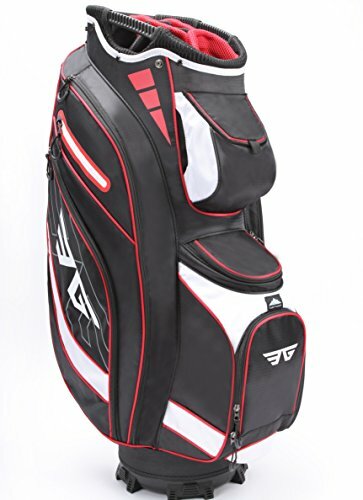 A straightforward cart bag with plenty of storage and reliable design, the TaylorMade Lite is an excellent option for your loved one who is just catching the golfing bug. Six pockets give plenty of room with a nice valuables pouch that is velour lined. Comfortable shoulder strap system makes it easy to take the bag on and off during your walk on the course. An added umbrella sleeve is great for carrying an umbrella without worrying about taking up too much space in the bag. Golfers who want a high-quality bag with a ton of features might be disappointed with this simple stand bag. The TaylorMade 5.0 stand bag delivers the same high-quality experience that the company brings with all of their golfing equipment. The bag utilizes a four-way top that keeps the clubs segmented and secure to pull when the time comes for your shot. Also, the 5.0 has terrific storage for a smaller bag, with six specific pockets that give the golfer plenty of room for balls and tees. It also allows the golfer to take his rain gear to the course without adding considerable weight to his carry through a special “garment” pocket. If you are looking for a bag with a safe pouch for valuables, the 5.0 has a velour-lined pocket that will keep your electronics scratch free. 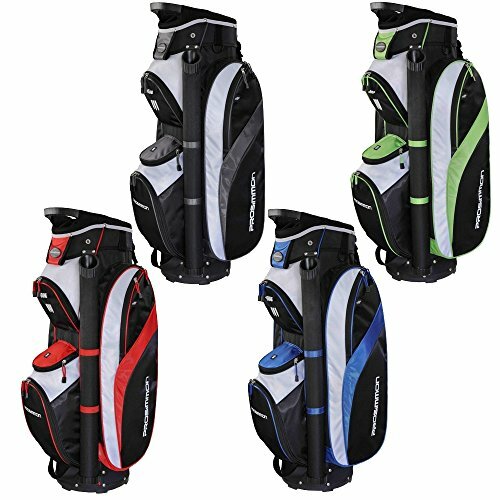 The 5.0 is a durable stand bag that provides comfort and safety for your clubs and valuables. We loved the anti-split stand system on this bag and how we never had to worry about the legs on the 5.0 sticking or becoming tangled. What shines in this TaylorMade bag is how much care went into planning and designing this bag. There’s the garment pocket, the included rain hood, and an umbrella sleeve that all seamlessly integrate with the overall concept of the bag. The dual-strap shoulder system left our back feeling refreshed after 18 holes. 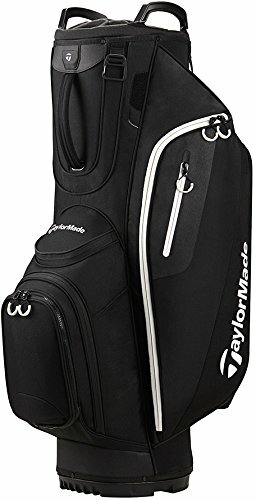 For a stand bag, TaylorMade has done an exceptional job of making this bag simple to carry and without the burden that other, less quality bags would put upon your upper body. 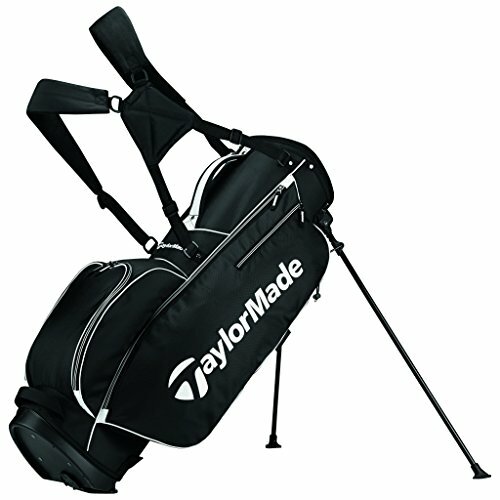 For a very affordable stand bag with a lot of features, you could do worse than the TaylorMade 5.0 stand bag. Easy to wear dual strap system makes putting on the bag simple. Durable bag with a sturdy two-leg system that keeps your clubs handy for the next shot. Lightweight golf bag that is ideal for walking 18 holes. Doesn’t have as much storage as other bags but is lighter as a result. 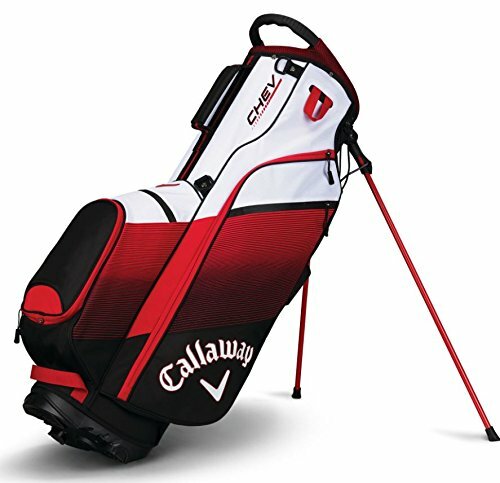 With a crisp, fresh look, the Chev stand bag from Callaway will please golfers of all ages and skill levels. With a five-way divider top highlighting the Chev’s features, this bag includes a velour-lined valuables pocket, a full-length clothing pocket, and an easy-grab handle that makes moving the stand bag uncomplicated. Although the Chev may lack some protection as the divider isn’t well padded, that shouldn’t detract from the bag’s overall look and functionality. This stand bag is vibrant and made for golfers who like a little color in their golf equipment. Taking the Chev out to the range, we took note of how quick the legs shot out for a stable hold when at rest. The legs are light yet sturdy and didn’t tangle or get caught up as we played our round and continued to set the bag up for our next shot. For senior golfers, we think the Chev is the stand bag that could get you walking a bit more because it has more storage than a Sunday bag but not enough that you’ll feel overwhelmed when you place the bag on your shoulder. For golfers of any age, the Chev is a nice and dependable golf bag that will provide a solid experience from the range to the final hole of your golfing day. Three full-length dividers allow for grouping of clubs into essential groups such as hybrids and wedges. The four-point strap system is one of the most comfortable carry systems we’ve tested in a stand bag. A rapid access pocket is great when you need to grab your phone or other necessity as you walk the links. Feels a little flimsy at times when walking, but this is an above average stand bag. Ogio has been making dependable stand bags for many years and their latest model, the Cirrus stand bag is another welcome addition to the company’s long history. The Cirrus comes with a seven-way performance top that allows plenty of room for all your clubs and features a small divider for your putter. An integrated handle at the top of the bag makes the Cirrus easy to move around and adjust as you need on the course. Lightweight and sturdy, this bag from Ogio has an insulated walking-accessible water bottle holder and a rapid access pocket, perfect for answering a quick text or call from your cellphone. The Cirrus stand bag has several features that you would find in a bag that costs twice as much. The four-point strap system is an absolute dream to wear and kept the clubs balanced as we walked the links. And we adored the luxury features on this stand bag, especially the rapid access pocket that kept our GPS device protected yet handy throughout the round. For the business person, who can’t go without checking their email or messages, the pocket is terrific for keeping the phone nearby without ruining your round. The reason you go for an Ogio bag like the Cirrus is that it is lightweight, simple to move, and easy to carry. There are times where it feels a little flimsy, and you may question its overall durability, but the Cirrus provides a top-rate experience for the golfer looking to add a few walking rounds to his golfing calendar. Putter pit is great for keeping your putter clean and free from damage. Six zippered pockets including a fleece lined valuables pocket for safekeeping of phone. Very affordable, high-quality cart bag that is dependable and does well at protecting your clubs. The straightforward cart bag is durable but lacks the flash and pizzaz of other similar bags. 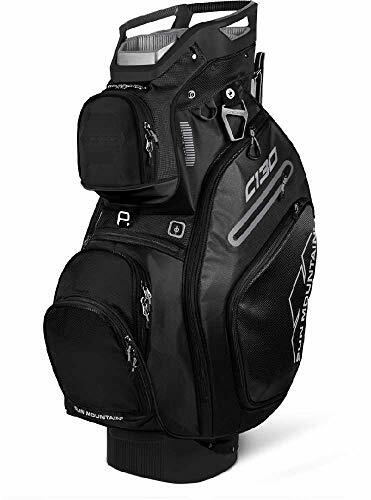 The Ogio Duchess bag is a nice entry level bag that features a clean 15-way top divider with a special pit that accommodates any oversized putter. The Duchess also features an easy-reach ball silo that keeps extra balls handy if yours, unfortunately, finds the water. The Duchess comes in multiple colors for a wide array of styles and choices. With a wide, padded bag strap, the Duchess is comfortable to carry. When you are ready to lock it down on your cart, there are multiple strap channels on the bag to make sure there is no twisting while you play. When we took the Duchess out for a spin, we liked that it was slightly smaller than most cart bags. Manufacturers can get carried away in making carts bag enormous with an unnecessary amount of storage, but the Duchess does well at keeping itself compact and light. The 15-way top divider might be too much for a beginning golfer, but as they grow into their full set of clubs, the divider does well at protecting the shafts from damage. If you live in a warm climate where you won’t need rain gear handy, then this Duchess bag is a nice alternative to the heavy cart bag that you’ll typically find on the market. With a steady hand, Ogio has designed a cart bag that is affordable yet plain. Weighs 2.5 lbs, making it one of the lightest stand bags on the market. Nicely made from very durable nylon fabric with the legs crafted from strong carbon fiber. Individual cell phone sleeve keeps your phone handy for quick calls and texts. Not a flashy bag, so if you are looking for more luxury features, this isn’t the bag for you. One of the lightest bags on the market, weighing just 2.5 pounds, is the Hyper-Lite Zero stand bag from Callaway. With carbon fiber legs that keep the bag sturdy, the Hyper-Lite Zero is an absolute dream to carry around the course if you love walking the links. With a cushioned four-way divider top, the Hyper-Lite does admirably at keeping your clubs off one another, but if you are looking for more separation, then this bag may fall a bit short. A zippered valuables pouch takes care of your GPS devices and other electronics, while a unique cellphone sleeve on the Hyper-Lite keeps all your messages and calls within an arm’s reach. 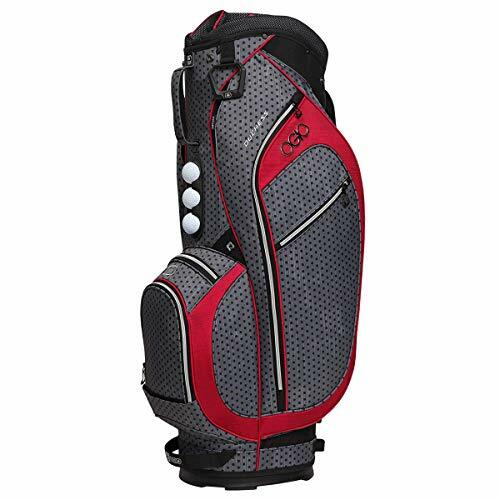 Great for beginning golfers or senior golfers who might want to walk the occasional nine holes, the Hyper-Lite Zero doesn’t disappoint if you are looking for a structurally sound bag that doesn’t burden your back and shoulders. When we got the Hyper-Lite out on the course, we were impressed with its function. The multiple handles allowed us to quickly move the bag on the range and in the middle of the fairway. The carbon fiber legs are strong and keep the bag locked in place. With the reduced weight of the bag, Callaway did sacrifice storage, but there is plenty of room for extra golf balls and perhaps, a jacket to cut the wind on colder days. 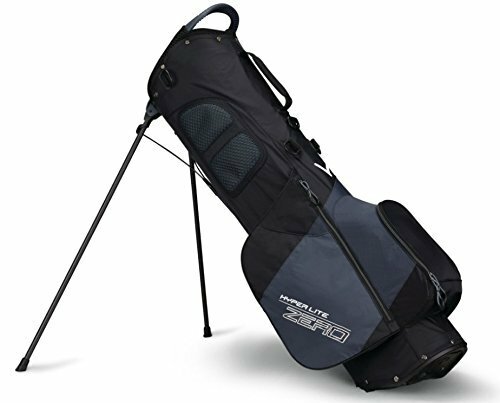 Convenient and durable, the Hyper-Lite Zero is a worthy stand bag for the high-handicapper looking to purchase a better, higher-quality golf bag. 15-way individual dividers keep your clubs separated and free from damaging each other. A soft-grip lift assist allows for easy raising of the bag into the cart for easy mounting. Seven pockets allow the golfer to store rainwear, valuables and golf balls. Another simple cart bag that isn’t flashy but does well at doing the minimum of what a golfer needs. Similar in style to their Go Lite Hybrid bag, Datrek has made a cart bag called the DG Lite II. Featuring a tough nylon exterior, the DG Lite II has a stunning 15-way top with full-length individual dividers. The bag also has several handles that make it a breeze to lift and place your cart bag in your trunk or while strapping it down to the cart for your upcoming round. Each handle is soft grip and assists with making movement easy on golfers of all ages. The DG Lite II does have fewer pockets than most cart bags with just seven total pockets; however, those seven do provide a decent amount of storage. When we took the DG Lite II on the course, we were impressed at the durability of the model. The DG Lite II is a sturdy bag with a solid foundation and a nylon exterior that appears to be ready to handle the punishment for several years. Some of the amenities such as the oversized putter well, the insulated cooler pocket and the fleece-lined valuables pocket, we found to be excellent additions that we regularly used during our 18 holes. A towel ring, rain hood, umbrella holder all round out the DG Lite II package and those are features that we want in a bag at this price point. The Datrek bag isn’t the sharpest looking cart bag on the market, but if you are looking for a bag that is a level above entry and does a stellar job at protecting your clubs, then the DG Lite II from Datrek is a solid choice. 14-way organizer at the top of the bag is full length, so it protects the entire club. A soft easy-grip handle allows for simple lifting into the golf cart. Top-Lok Technology is an exclusive cart attachment system that locks the bag into place with ease. This stand bag is more complicated than it needs to be but provides a solid experience on the course. 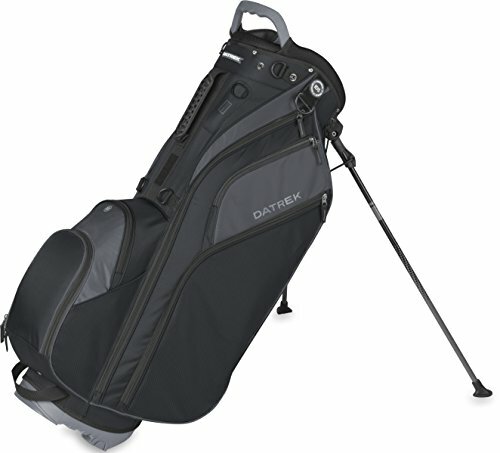 Datrek has been making premium golf bags for a long time and their new stand bag, the Go Lite Hybrid, continues the company’s tradition of creating solid bags that remain durable and withstand the beating of repeated trips to the golf course. The Go Lite features six zippered pockets that provide plenty of storage for everything you’ll need on the links. A double ergonomic shoulder strap system and cushioned hip pad make carrying the Go Lite Hybrid comfortable and secure. The Hybrid also features a sturdy base that helps with the two strong lockable legs with slide resistant feet for holding its position regardless of the terrain. For us here at Golf Influence, the highlight of the Go Lite was the Top-Lok system. Although most buy stand bags for a lightweight experience that’s ideal for walking, some want the flexibility of using the stand bag in the cart without twisting in the cart’s bag stall. We were impressed with how the Top-Lok system kept the bag in place throughout the round. When using the Go Lite Hybrid on the course while walking, we were impressed by how the hip pad and strap system worked well in tandem, keeping the bag level and our body free from exhaustion. If we have an overall complaint about the bag, it is that for the price we felt that there weren’t enough bells and whistles that more established bag manufacturers would add at this price point. That said, this bag is solid and will provide a quality experience for your next round. 14-way divider top keeps clubs in individual pockets for damage reduction. External putter tube is perfect for golfers who use mallet head putters and need the extra room. The bag also comes with a velcro glove holder, golf towel ring and umbrella strap. Everyday cart bag that is affordable but offers bare minimum features. Another inexpensive, entry-level cart bag that golfers have taken a liking to is the ProSimmon Cart Bag. With a 14-way divider top that is padded to keep your clubs safe, the ProSimmon is a solid cart bag that offers a lot of storage. Features on the ProSimmon include a deep ball pocket, fur-lined valuables pocket, external umbrella strap and rain hood for keeping your clubs dry during rainy weather. A unique addition to this latest model is a putter tube that holds your mallet away from the other clubs and easy to access when it comes time to putt for birdie. Like the Eagole cart bag we also reviewed in this guide, the ProSimmon is a simple bag made with less durable materials to keep the price lower. That doesn’t mean that the bag doesn’t have its highlights. We enjoyed the storage capacity and the external putter tube. Most of us at Golf Influence like using a large-headed putter but hate when we have to integrate it with other clubs, the tube prevents us from doing that. Most of the typical cart bag features will be found here with the ProSimmon as well. Two full-length clothing pockets allowed us plenty of room for our rain gear and although we like the valuables pocket we wished it was rainproof. 14-way divider system allows the clubs to breathe inside the bag. A luxurious cooler pocket keeps your drinks and snacks cold. Multiple pockets allow you to carry shoes, towels, umbrellas, and valuables inside the bag. An uncomplicated cart bag that checks a lot of boxes but doesn’t exactly dazzle golfers. If you are looking for an entry-level cart bag that may not turn heads but provides a quality experience, then the Eagole cart bag may interest you. With a 14-way divider top, golfers love the protection and storage of the Eagole bag. Nine pockets, including an insulating cooler pocket to keep those drinks cold for your round, is included with the cart bag. Towels, shoes, electronics, and umbrellas all have a place on the Eagole cart bag. 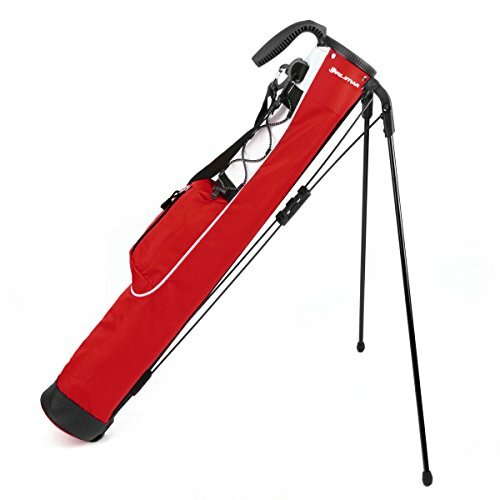 The company’s e-trolley and trolley lip system makes the cart bag perfect for older golfers who might have trouble lifting their bag and securing it to the cart. The system keeps the bag in place on the cart and assists golfers in getting the bag secure, so there’s no twisting. Although the Eagole cart bag won’t turn the heads of your friends, the bag is workman-like in its dedication to providing storage and protection to your clubs and valuables. We liked that we didn’t lack for room in this cart bag with the stunning amount of pockets available for our devices, beverages, and accessories. If we had a complaint about the Eagole, it was that the exterior of the bag seems to be of a lower quality material than other cart bags by companies like Sun Mountain. The Eagole is an entry-level bag that will give you a few solid years, but we aren’t sure we can certify that this bag will last you for a decade. Very lightweight carry bag that is ideal for a quick trip around the course. Holds up to 6-7 clubs with a two-compartment top for simple carrying. One accessory pocket is large enough for balls, tees, and a scorecard. A very basic bag that doesn’t offer much more than the ability to carry a few clubs. The Orlimar Pitch and Putt stand bag is the only Sunday bag on our list. Small, lightweight and easy to carry, the Orlimar is for beginning golfers or amateurs who want to begin the slow climb to walking 18 holes. Weighing less than two pounds, the Orlimar can carry up to seven clubs without burdening the golfer. Two sturdy retractable legs make this an excellent Sunday bag as you won’t have to leave your clubs on the wet ground when playing. One accessory pocket can carry enough balls and tees for your round. 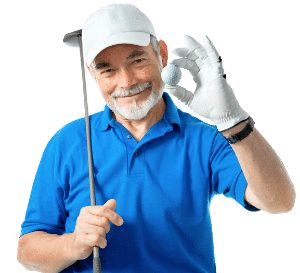 Expect a capacity of four to six golf balls, so if you are a high handicapper, you might ask your playing partners to carry a few more if they have the room. What we love about the Orlimar is not only is it one of the lightest bags we’ve ever tested, but it also comes with a solid grip bar in the middle, so you can lift and place the bag on your shoulder without a problem. The shoulder strap isn’t wide or unusually long, so you might have to replace that a couple of times over the years, but we didn’t notice an issue when we were playing a round. The strap was comfortable on the shoulder, and at the end of the round, we really saw the difference in how good we felt as opposed to when we carried weightier bags. For comfort and simplicity, the Orlimar Pitch and Putt is one of the best Sunday bags we’ve ever tested. It may seem silly that appearance is important in a golf bag, but most professional golfers will tell you that confidence in equipment translates to confidence on the links. A golf bag that looks sleek with sharp colors can provide the golfer with a boost in the conviction that today will be their best day on the course. And as vain as this may seem, no golfer wants to show up for a round with business associates or friends with a bag that has mismatched colors or an ugly exterior. Most manufacturers realize this truth and have designed their latest bags with a nod toward building a golf bag centered around function without sacrificing style. The weight of a golf bag is often an overlooked detail for amateur golfers. 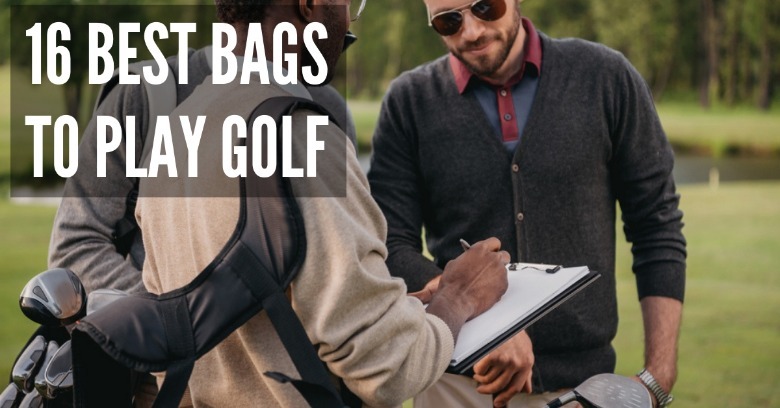 The last thing an amateur needs to do is find the largest bag available because it has a hundred pockets or some other unnecessary feature that only adds weight and makes for a longer day at the course. This advice is especially true for golfers who like to walk the course. Most stand bags try to keep the weight of the bag as light as possible, so the walking golfer doesn’t break down from exhaustion on the back nine. If you are seeking out a cart bag, then the weight is far less of a consideration, but for those looking for a great stand bag, then understand how the heft affects the functionality of the bag. When deliberating on what bag to purchase, always look at the weight as a significant element of how the bag will perform for you. Just like Goldilocks, you are looking for just the right amount of storage in a golf bag. Some companies believe that building a golf bag with a dozen pockets and promoting maximum storage capacity as a high selling point is the way to go but that just isn’t the case. The reason why that is true is more pockets typically converts into a heavier bag for you to carry on the course. So when doing your research for a golf bag, take note of how many pockets a bag has and then do the math on what you need those pockets for when you are on the course. For example, ask yourself are you in a rainy area? Then maybe you should find a bag with storage capacity for rain gear to keep you dry. Same goes for valuables. Most new bags have accommodations for your cellphone, wallet, and jewelry. Look for bags with velour-lined pockets that are waterproof if this protection is vital to your trip to the golf club. Protecting your clubs and your valuables are incredibly important in a golf bag. For the clubs, bags will have dividers in the top opening to situate your clubs and make them easier to pull out when you need them for an upcoming shot. Now, those dividers can run the length of the bag, making them “full-length” dividers. Some bags even have individual full-length dividers, giving clubs their own protective cocoon. If you’ll go back to the top of the bag, notice how the opening is lined. Is it padded? Or bare? Realize that the lower section of the shaft of the club will rub against this area during travel and as you walk the course. Manufacturers have gone to great lengths to make sure the clubs are protected with padded linings that offer a buffer that keeps your clubs safe and protected. Same goes for your valuables. All current bags will have some special pocket for valuables that keeps phones from being scratched, but not all of them will be waterproof. If keeping your valuables dry is important, especially if you live in a rainy area, then search for waterproofing from that valuables pocket. If you are spending hundreds of dollars on a golf bag, the last thing you want it to do is fall apart after a couple of years. Whether you choose a stand or cart bag, you must do your due diligence in finding a bag that will withstand the rigors of a trip to the course. If you choose a stand bag, areas to focus on include the durability of the legs that hold up the bag. Ask yourself what are the materials used for these legs. Are they carbon fiber or aluminum? Carbon fiber is lighter and shatterproof in most cases. Same goes for the cart bag, but instead of the legs, focus on the padded opening of the bag because this is the area that will show damage first, due to the rubbing of clubs against that padding during travel. What are the key features a great golf bag should have? There are several features that a great golf bag has that provides exceptional protection for your clubs and plenty of storage for all of your necessities on the golf course. The first feature is durability. Every golf bag must be long-lasting and withstand the punishment that a trip to the course can place upon a bag. Another area to focus on when buying a golf bag is the appearance of the bag. Does it look cheap? Are the colors mismatched? Golf bags that look nice instill confidence in the golfer. It may seem superficial, but it is true. Weight and storage are two characteristics that go hand-in-hand when searching for the right bag for you. The more room a bag has, the heavier it will be on the course if you fill those pockets with items. Knowing the weight of a bag is crucial if you plan on using the bag for walking the course. Finally, the bag must be able to protect your clubs and your valuables. Everyone playing golf takes their cellphone or other electronics to the course. Most bags have individual protection pockets that hold those valuables safely. Also, notice how the bag protects your clubs through padding and full-length dividers that keep clubs on their own. What’s a golf bag ideal size & weight? When picking out the perfect bag for your game always factor in how much the bag weighs. If you are in the market for a cart bag, then obviously you care about weight a bit less than someone searching for a stand bag. Cart bags, when loaded down with clubs, balls, and other accessories, can weigh around 30-40 pounds. That’s not exactly something conducive to walking the course, which is why it is called a cart bag. For walking, you’ll want a stand bag, and those models are built with a weight reduction in mind from the beginning. Without anything in the bag, a stand bag can weigh less than two pounds. This small weight figure is why stand bags are also so attractive to golfers who will never walk the course because the lack of weight makes the stand bag easy to carry from car to cart. What are the different types of golf bag and which one should I go for? There are four types of bags available for golfers, but only two bags stand out as viable options for most amateurs. The first bag is a small bag with only room for a handful of clubs and even less storage. This bag is known as a Sunday bag because decades ago golf clubs were closed on Sundays; therefore there were no caddies, so players had to carry their own bag. So, a small bag made for easy carrying was invented for those Sundays. The problem with Sunday bags is that they can’t carry all your clubs and hardly any of your necessities. That brings us to the two viable options. 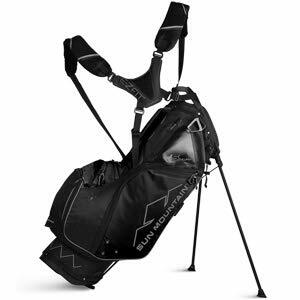 The first is the stand bag which is light and has two foldable legs that pop out when the bottom of the bag comes into contact with the ground. Your clubs are easily accessible, which makes the stand bag ideal for walking golfers. The next option is the cart bag. These bags are more prominent, bulkier and can store more of your balls, rain gear and even, an umbrella. Cart bags are meant to ride in a cart; therefore they have no foldable legs attached or attachments that can make walking more comfortable. Another version of the cart bag is the tour bag, made specifically for professional golfers. These bags are built for maximum storage and are incredibly expensive and cumbersome. Should I go for a stand or a cart bag? When choosing between a stand or cart bag, there are several areas of difference to consider. For stand bags, finding one that is durable with high-quality legs is a must. Most stand bag legs crafted from carbon fiber are light and have terrific strength. Also, realize that stand bags will be lighter and less rigid than cart bags; therefore they can potentially break down easier. Keeping the stand bag clean and properly stored will assure that your bag lasts for many years. Cart bags are unique in that they need a place to stand when storing. If you want to keep your cart bag healthy for the long run, then find a safe place in your garage or club for the bag to stand tall naturally. The main difference between a cart and stand bags is the weight. Cart bags are noticeably heavier than their stand bag counterparts. Another benefit of having a cart bag is the extra padding around the bag. When you are searching for cart bags, ask yourself how does the padding line the opening for the clubs? After a time, that padding will wear down as your clubs rub against it during play. This area is most likely where your bag shows wear and tear, so pay attention to that section when buying a cart bag. 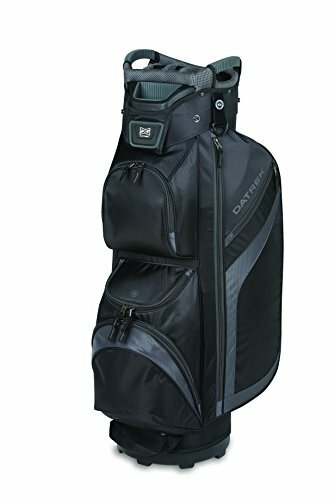 What are the known brands that make golf bags? There are two divisions of golf bag manufacturers. The first comes from the most popular golf brands that all golfers know and love. Companies such as Ping, TaylorMade, and Callaway all make high-quality bags that are resourceful and durable. Other companies that only make golf bags but rival the construction of the name brands include Ogio, Sun Mountain, Datrek and Izzo. These companies make terrific golf bags worth a look. Small vs. Big golf bags: what’s better? In this battle, the primary deciding factor is if you want to walk the course regularly or not. Small bags such as Sunday or stand models are ideal for walking the links. They are lightweight and keep your extra accessories to a minimum. Bigger bags such as cart and tour bags will give the golfer maximum storage and therefore, more weight to transport. If you typically play with a cart and only lift your clubs from your trunk to the cart without carrying them, then a bigger bag certainly has its advantages. Do certain golf courses have specific restrictions on what type of golf bags I can bring? Each club is different with their specifications and rules for golfers, but almost all of them require golfers to have some bag to carry their clubs in during their round. The best rule of thumb is to call the pro shop ahead of your round and ask what the rules are if you are bringing a unique bag, such as a Sunday bag to the course. You should feel safe that if you own a cart or stand bag, that the club will have no problem with this option. Most bags are made from nylon, so they are easy to clean with a little dish soap and warm water. Just take a soft rag and wash dirty areas of the bag, then wipe away the excess soap with a wet towel. Do not use chemicals or cleaners on your bag as they will break down the fabric, causing your bag to accelerate with age. If you own an expensive tour stand bag made from leather, you should also be very careful with your cleaning and maintenance of your bag. Most golf bags are not waterproof, so you have the option of using a waterproofing spray on the exterior. It is always wise to have a rain hood for your bag, in case the weather turns terrible but for the outside lining, you can find sprays that limit the moisture exposure to your clubs. Another area that may be waterproof is your valuables pouch in the bag. Not all bags have lined pouches that keep the water away from your electronics, but if this feature is essential, there are plenty of bags that have this protection. Is it feasible to repair a golf bag on my own or should I buy a new one? It depends on the severity of the injury to your bag if you should repair or buy a new model. If you are talking about a rip or tear in the exterior, then there are plenty of patching options to choose from to help you repair your bag. If your bag is older and is showing severe signs of wear and tear along the padding that protects the clubs, then you should start saving for a new bag that won’t hurt your irons and woods. Regardless, if you are unsure, ask for the help of a club pro or equipment profession in determining what step you should take next in repairing or replacing your bag.